My approach with the abstracts so far has been to draw a bunch of pencil lines, letting them form shapes where they cross, and then drawing over the ones I like best with a pen (dark in the first two paintings and light in this one). I like the lines and am not quite ready to give them up. For this painting the lines are also painted, covering the light pen underneath. The color makes shapes from the lines. Then I got a little wild with the "face paint" and echo marks. 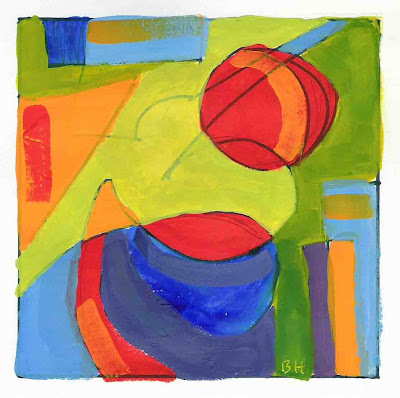 Abstract 3 is in gouache. Too busy? Overdose of color? Let me know what you think. 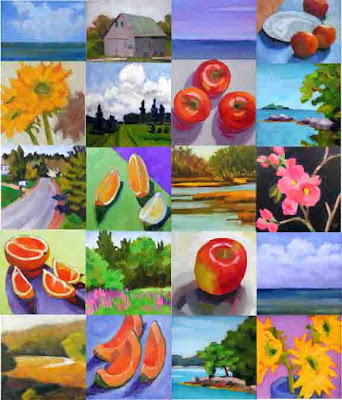 These are the other paintings in the upcoming show at The Gallery at Boothbay Harbor. 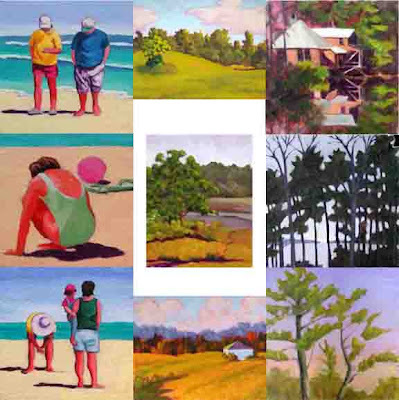 They are all oils, and the relative sizes are not quite right (the middle top and bottom paintings are larger and the beach people are smaller in real life). I just love making these collages! Hope to see you at the show. This morning I practiced the demo that I am going to do on Friday at The Gallery at Boothbay Harbor. The top photo is a rough in, or first pass of color, for the practice painting. 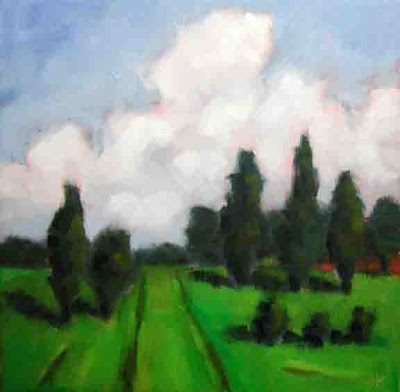 The subject is the field in Castine which I painted in April. It took about 40 minutes including a bit of talking. My husband was happy to interrupt with questions he thought would be typical (only if Homer Simpson comes to the opening!). The bottom photo is the finished painting, after another 30 or so minutes of adjustment. There was a big temptation to keep at it, but I think this is where I would stop for a demo, while it is still fresh. It would be easy to overwork it. I made some notes about points to being up, so I feel like I'm ready. The best advice on how to prepare for a demo came from Carol Marine. She told me that the key is to accept the demo painting won't be your best, and it will go fine. That sounds like good advice. 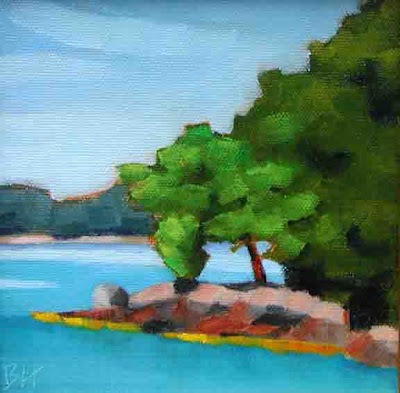 These images are the daily paintings that will be in my show which opens next week at The Gallery at Boothbay Harbor. I think all but one of them can be found in earlier blog posts. They were all done in the last year, most of them in the last 5 months. I will do a painting demo on Friday, July 3rd at 3PM at the gallery, as part of the opening. I am really excited about the show, which will be on for a month. It is great fun to work with my friends Rick and Pandy who own the gallery. I hope some of you can join us for the opening. Look out for an upcoming post on practicing for the demo. I'm enjoying the abstracts very much. This is yesterday's effort. I was thinking about spring, and how lush and green everything is, especially with all the rain we have been having, and about the wonderful peony garden at Maine Audubon Gilsland Farm which I have visited three times in the past two weeks. I let myself doodle on the page with a few lines, and then chose those I liked best to highlight with marker. I had chosen a palette (more about my palette experiments in another post, but there is method to the madness) and I began with the pink, thinking about how to balance the image. The other colors followed, sometimes following the lines, sometimes not. A couple of places got wiped off, I think there was another dark blue area at one point, but I don't remember where it was. I just kept at it until I liked it. 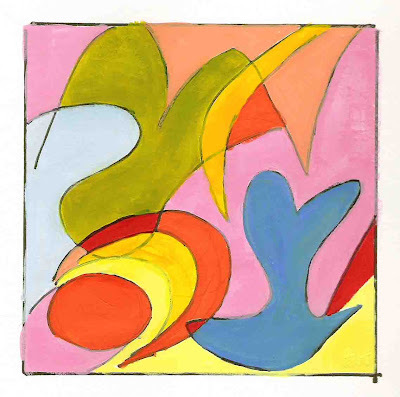 I worried about the bluebird a bit, but it is about spring after all, so the bird got to stay (Abstract 2 5"X5" gouache). This painting is available for sale online at my zatista store. Now that the show is ready, it's time for some fun, time to stretch my mind and get a fresh perspective. My friend Kristin loves abstracts, and she's been searching for some large ones for the office. I have enjoyed looking over her shoulder at the work. I kept asking myself what was the artist thinking about while they painted this? So I did some reading online about painting abstracts. Check out advice from Martha Marshall and Marten Jansen. Here's my first attempt, small of course, since it is a daily painting. 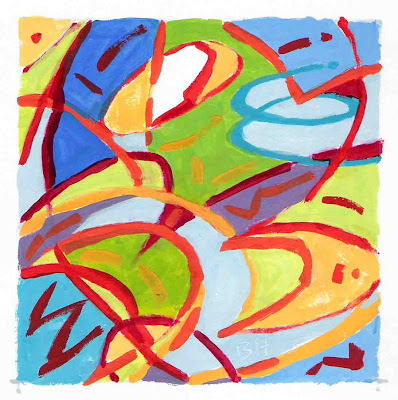 I will let you know tomorrow if Kristin likes "Abstract 1" (gouache 5"x5"). I have had another Sunday of framing and long to get back to Sundays of painting! But thanks to my friend Suzanne and my helpful son, Alex, the framed paintings are ready for delivery next weekend to the Gallery at Boothbay Harbor. More than 20 of them are paintings shown on the blog, (now) including this one is from last winter, painted from a photo of the marsh at the head of Broad Cove, which separates Princes Point from the Yarmouth shore (Broad Cove Marsh 6"x6" oil). I remember once coming into the marsh with our old dog Kelly in the boat. The first bird she saw, out of the boat she went, very surprised to find that she was swimming! It was a muddy ride home. Two weeks from tomorrow my solo show at The Gallery at Boothbay Harbor opens. Time for me to start practicing that demo (after I finish framing!). This painting, done late last fall when sunflowers were plentiful, will be part of that show. 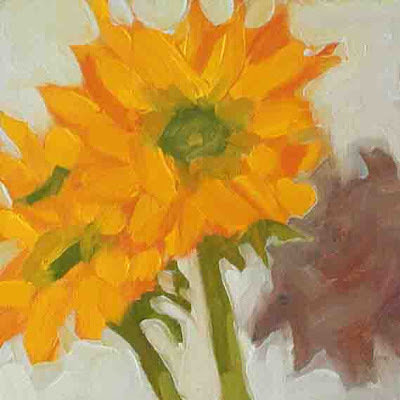 "Sunflower Shadow" is a 6"X6" oil. Shadows inspired by, you guessed it, Carol Marine. 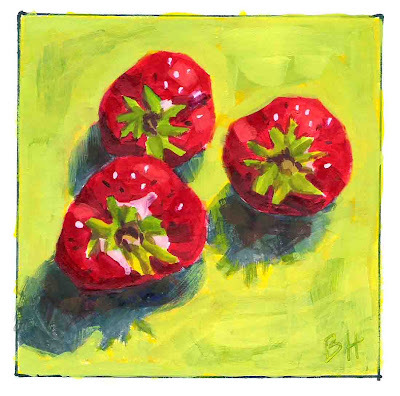 I really love the strawberry oils done by Carol Marine. Last week she did a few more, and they are just wonderful. I was inspired. This is my first attempt at these little beauties, done in gouache, which I like to use when exploring a new still life subject. This painting is available for sale online at my zatista store. Yesterday was so beautiful, I started out the day standing on our neighborhood pier painting the point with the water showing through the outermost tree branches. Today was all about framing for the upcoming show at The Gallery at Boothbay Harbor. That's a good task for a rainy day. This painting is from a few weeks ago when I had a late afternoon meeting near MIT in Cambridge, and didn't want to face the traffic heading to Maine. I decided to take my backpack over to the Charles River and paint the Boston skyline. 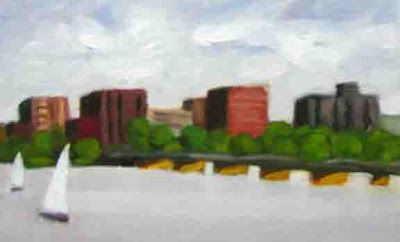 I am pleased with the buildings and the bridge, but the water should be darker. It was really fun. And in other news, I am now selling my paintings online at www.zatista.com as well as at The Gallery at Boothbay Harbor and The Yarmouth Frameshoip and Gallery. 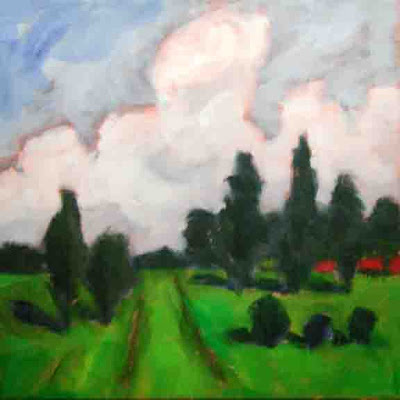 It is a new site, specifically for selling art. Do check out my zatista store. 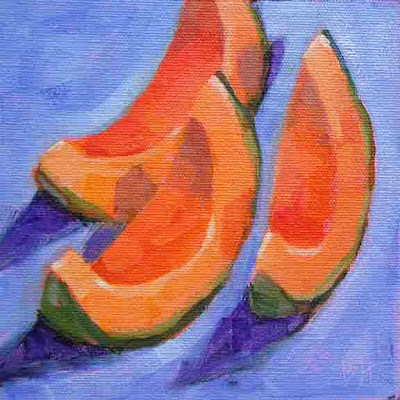 I enjoyed painting the gouache melon slices so much that I wanted to give it a try in oils. 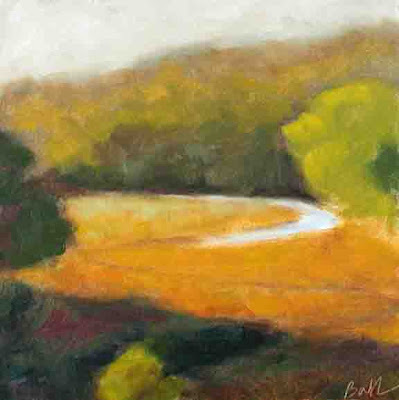 This one (6"X6" oil) was done from the gouache painting. It certainly took longer (about twice the time), but I like the result just as much. My son cut open a cantaloupe the other day and I immediately started thinking about how to paint the slices. All that orange! But after I got the shapes right, it was fun. 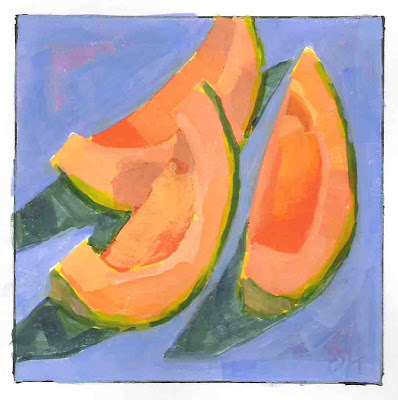 "Breakfast of Melons" is 5"X5" in gouache. This painting is available for sale online at my zatista store.